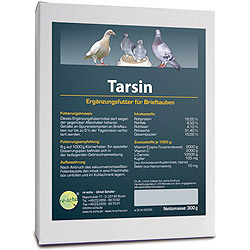 Tarsin is an „allround product“ which can be applied the full year (breeding, journey period and moult). On a basis of carefully selected vegetables Tarsin is well-balanced for good-natured bacteria of the small intestine (like lactobacteria) and therefore the ideal supplement for the re-scha lactobacteria RS-12. Vegetables with high concentrations of carbohydrates (different types of sugars) are the best nutrition medium for lactobacteria. Under these conditions lactobacteria like RS-12 (lactobacillus salivarius) are able to grow and compete in the small intestine. Experiments proved that the RS-12 lactobacteria population in the small intestine increased by a factor of 100 to 1000 under combined treatment with Frutin and Tarsin showing the additional amplifying of the so-called booster effect. The high concentration of vitamin C in vegetables is well known. The organism needs vitamin C as a support for the immune system. Vitamins of the B-group (like vitamin B1 and B2) which are prominent in vegetables, too, are very important for the energy metabolisc processes involved in the decomposition of fat, carbohydrates and amino acids. Additionally vegetables contain a lot of different minerals having high importance for a trouble-free metabolism. Tarsin contains a well-balanced amount of Green-Lipped Mussels (Perna Canaliculus). Green-Lipped Mussels are an insiders' tip for the joint mobility, and they contain highly concentrated glucosamino-glycans (GAGs). GAGs are special sugar-protein bonds with an excellent bioavailability. Moreover, the Green-Lipped Mussel contains a high amount of omega-3 fatty acids. Thus, it can foster the production of conjunctive tissue, articular cartilage and synovial fluid (synovia). Tarsin contains high-grade protein sources of natural origin improving and enhancing the amino acid pool of the organism. Birds need the amino acids alanin, arginin, aspartic acid, cystein, glutamic acid, glycin, isoleucin, histidin, leucin, lysin, methionin, phenylalanin, prolin, serin, threonin, tryptophan, and valin. Amino acids are known for their contribution to muscle growth and their support of the immune system. Tarsin contains raw products from natural sources including these amino acids. Tarsin also contains high-grade lecithin which is necessary for the absorption of fats from the organism during digestion. Lecithin is an essential component of our nutrition supporting the physical activity. Without lecithin there would be no respitory chain. When Tarsin is constantly applied there is no need for any other lecithin supplement. Tarsin contains a high dose of carnitin. Carnitin is important for the transport of fatty acids. It leads the fatty acids to the place of decomposition. Many biochemical processes need the direct or indirect support of carnitin. Tarsin contains trace elements in a chemical structure known as chelator. It is generally accepted that organically bound trace elements have a better passage through the gastrointestinal barrier than inorganically bound. Normally, not the absolute amount of trace elements is of importance but the digestibility or absorption capacity. In the organism trace elements play an important role as components or activators of enzymes. Tarsin contains vitamin E and selen as additives. Vitamin E protects the fat molecules from the attack by free radicals. Selen is an essential trace element for the organism very important for the function of the immune system. Free oxygen radicals have to be removed from the organism or their synthesis has to be inhibited in order to protect the immune system. In breeding Tarsin supports the receptiveness, fertilisation and the growth of young animals. Tarsin conditions the pigeon for the journey and guarantees an impressive motivation even under difficult journey conditions (head wind flights). In moult Tarsin provides important raw materials for a trouble-free moult process and an intact silky feather. For its optimum activity Tarsin should be bound to the food together with Frutin. Both products (Tarsin and Frutin) have additive activities. Because of the adhesive effect of Frutin grain food could be ready-mixed for some days in advance. The feeding with Tarsin should not only be done once per day, but in the morning and in the evening, additionally. So Frutin and Tarsin should be added to the complete grain food of each feeding day. The full activity of Tarsin is achieved when RS-12 lactobacteria are included in the first application (for 10-14 days). Lactobacteria of RS-12 stay vital for more than 3 days at room temperature on food mixed-up with Frutin and Tarsin.